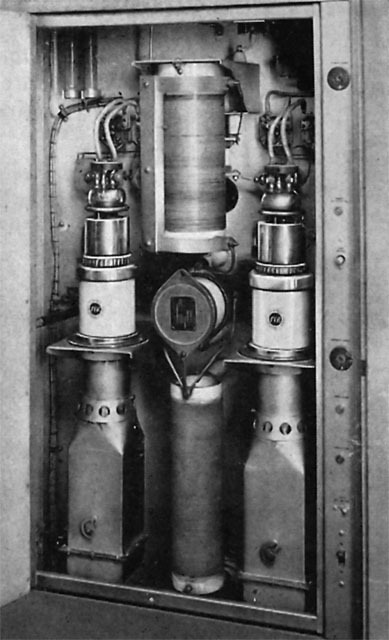 WPAT GATES 5KW Transmitter Pair. 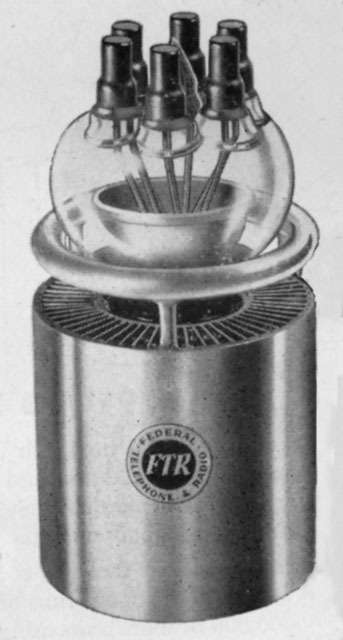 The far transmitter was the newer model BC5P2 main transmitter. The foreground is the former main transmitter which was an older GATES 5KW model BC5P . Closeup of 5KW GATES BC5P transmitter. WPAT equipment - crystal exciter/oven, audio compander and other audio equipment, Ampex reel-to-reel deck, program logger tape machine. 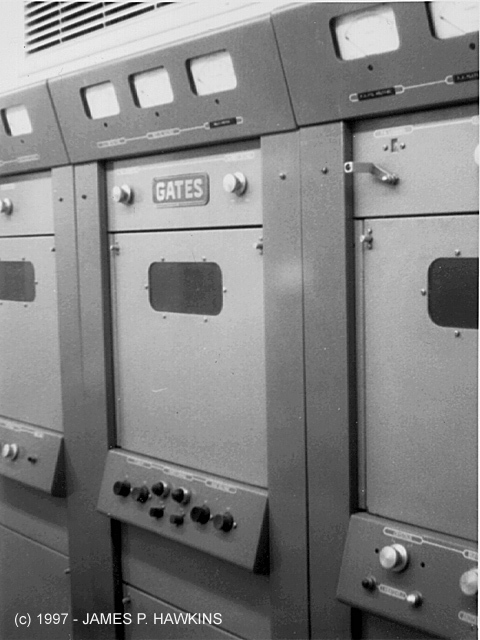 The Gates BC5P in the foreground was replaced by a Gates MW-5 before 1979. Alan Kirschner, engineering supervisor (WA2UCV) replaced the Gates BC5P2 in the background with a Nautel Ampfet 5 solid state tarnsmitter. 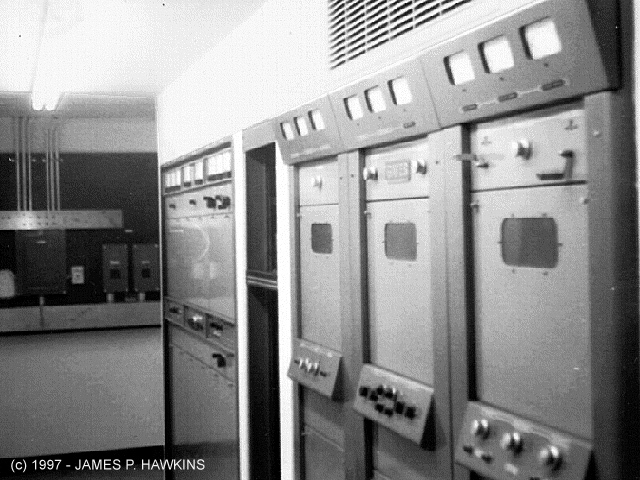 The rest of the equipment shown here was long gone when Alan started at the station in 1979. 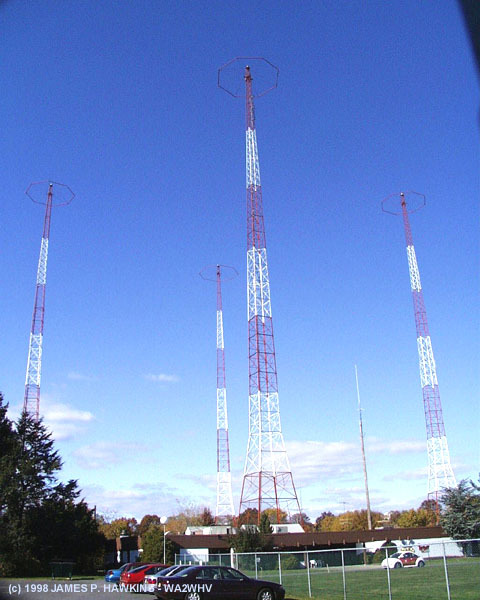 Transmitters are located in Clifton, NJ along the Garden State Parkway, just north of the Bloomfield Exit. Four towers with capacity hats are close to the Parkway. Some photos show equipment scattered and in disarray because they were in the midst of remodeling the entire station. WPAT was for many decades, an easy listening station. Within the last 5 years, they gradually phased out easy listening, replacing it with and increasing the amount of soft-rock with the slogan "No more sleepy elevator music!". Too bad, I liked to relax to "sleepy elevator music" in my easy chair and read or just relax. After all, I don't feel like being "cool" ALL the time, especially after a hard day's work! Then, suddenly they were bought out and are now a Spanish speaking station. 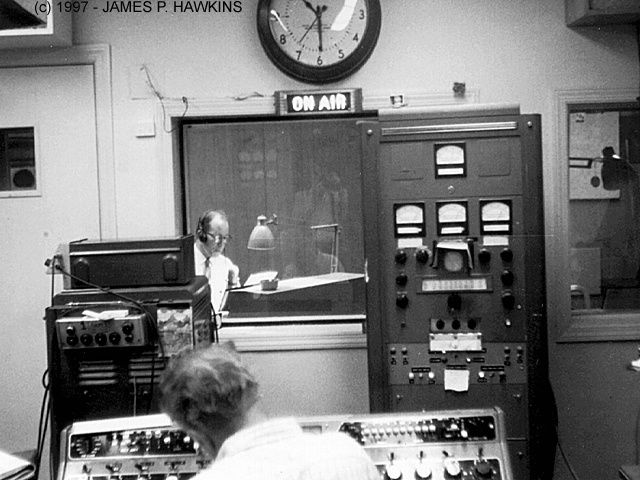 View of studio and announcer through control room window with mixer console in foreground. 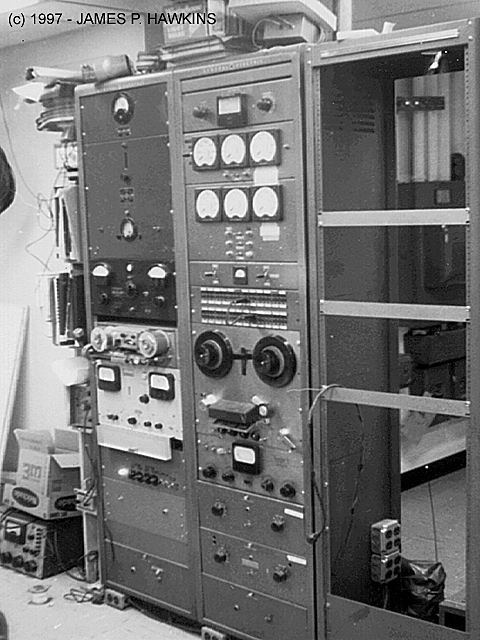 Robert Sudock - WB6FDF Anchor, Amateur Radio Newsline and Assistant Director of Engineering at KTTV, Los Angeles, recalls the equipment in this photo. At the top of the photo is a General Radio modulation monitor. The device used to log the station was known as a SOUND SCRIBER. It uses 2-inch wide tape, has a transverse set of scanning audio heads, and recorded 24 hours on one of those spools. Something in the back of my head makes me want to say a week per reel, but I'm sure it is really only 24 hours per reel. Anyway... 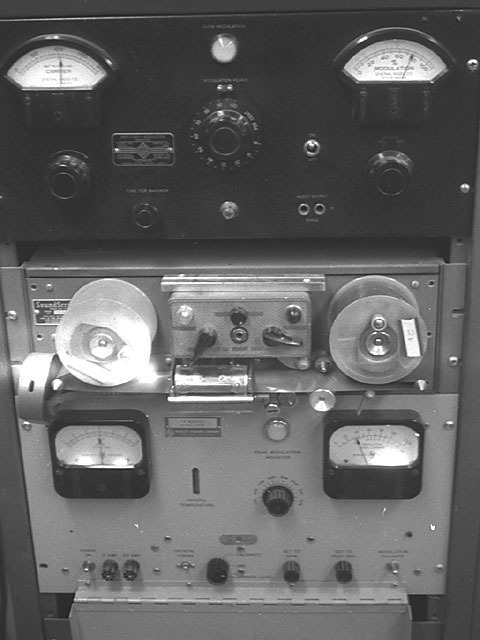 The linear tape speed was 15/16 or 15/32 IPS, the quality not much better than about 3 KHz (sorry, KC in those days). The recording was obviously monaural and the factory stamped the time-of-day on the back of the tape as a time index. So, if you started at midnight, you lined up the 0000 with the pointer. Every few inches you would see 0015, 0030, 0045, 0100 ... 2300, 2315, 2345, etc. That's as accurate as it got. The clear lens housed an NE-51 which was used to indicate modulation levels. Next, the power/record level and playback volume control. The dark lens on the right was another NE-51 used as the pilot light. The lever switch pointing to 7 o'clock is the record/play selector. In the center a 1/4-inch earphone jack. The lever switch pointing to about 4 o'clock was used to engage the drive mechanism. Winding forward and reverse was done by hand. Note the reel keepers double as cranks. Below the control panel is a mu metal shield covering the heads. Note the tape is bent into the shape of a half-tube (180 degrees) as it passes over the heads. The long path permits the gradual shape to and from flat. The tape moves from left to right. Below the take-up reel at about 7 o'clock and just beneath the tape is what we would call "tracking" on our VCR but really more imitates the framing adjustment on a motion picture projector. This was a mechanical adjustment to move transverse tape tracks directly over the rotating heads. Remember there is no control track or sprocket holes to line things up. The device below the Sound Scriber is a Hewlett-Packard Broadcast Modulation and Frequency Monitor. I don't recall the model. I'll try to describe what's on the front panel, but it's been more than 25 years! The unit was designed as a calibrated, precision receiver. Monitoring frequency was determined by a crystal in a temperature-controlled oven. It also had a high fidelity 600 ohm balanced audio output -- nominally 1 mw at 0 dBm. The left-hand meter shows "FREQUENCY DEVIATION" from center frequency. I was only aware of an FM monitor, however, if an AM unit was made, then the full scale was +/- 30 CPS (+/- 20 CPS is maximum deviation allowed from the FCC assigned carrier frequency). For FM, the scale would be +/- 3 KC with +/- 2 KC the FM tolerance. Next, is the HP name plate with serial and model numbers. To the right is the "PEAK MODULATION INDICATOR". This is a lamp that flashed when the modulation exceeded a preset level. Used more as a warning ... hey, you're too loud! To the extreme right, the modulation meter. In two scales, the top scale is calibrated in "PERCENT MODULATION" with 100% being the maximum allowed. The bottom scale was calibrated in dB. I may be mistaken, but 100% (in FM at least) is something like +22 dBm. Remember this is modulation, not audio. Below the name plate, a slot cut in the panel to observe the mercury thermometer built onto the crystal oven's wall. As I recall, 85 degrees Centigrade was the target for "CRYSTAL TEMPERATURE". To the right of the temperature slot is a pot that set the threshold for the peak flasher. Not titled, the scale markings were 50% to 120% in ten percent increments with 5% hacks. A metal door covered the controls at the bottom of the chassis. The flat, oval piece centered above the controls is a ferric strip for the door magnet to grip. The power switch at the bottom left is for the amplifiers and panel lights. The temperature sensitive components remained powered. For servicing, another power switch on the rear panel shut the entire unit down. Next, are two fuses -- I think. These look line banana jacks for audio monitoring, but the panel label for the left item sure seems to read 2 AMP. As I say, it has been more than 25 years. To the right is a trimmer for "FREQUENCY CALIBRATE". The large knob in the center is the CALIBRATE - OFF - OPERATE knob. In the upper (calibrate) mode, the unit would mute and disconnect from the outside world. You would then be free to adjust the two pots to the immediate right. The first, "SET TO ZERO" would center the frequency deviation meter. The next, set to 100% (I can't recall the exact nomenclature) would calibrate the modulation meter to the 100% hack. With the selector in "OFF", the unit would be fully powered but muted. This was the mode most stations used at sign-off (if they did sign-off). Once the transmitter was shut down, you were presented with hi-fi white noise. Since there was no squelch, there had to be a way to keep things quiet without powering the amplifiers down. This was it. The last position is "OPERATE." If my niece heard me explain this one, she'd say "Duh!". The last switch, "MODULATION POLARITY" allowed selection of + or -. The following information was obtained and condensed from the book "The Airwaves of New York" by Bill Jaker, Frank Sulek, Peter Kanze. I highly recommend this book as a handy source of New York Radio History as well as for additional information and details on WPAT, left out of this text..
WPAT began broadcast in 1941 on a frequency of 900 KHZ as a Paterson, NJ station. The first studios were located in the Exchange Building at 115 Ellison St., which had been the home of the O'Dea Temple of Music and WODA calling itself "North Jersey's Own Station." One year after sign-on, WPAT added studios at 1060 Broad St. in Newark, which was formerly used by WAAM and WNEW. In 1943 WPAT moved out of the old Temple of Music to new studios at 7 Church Street in Paterson. Joe Franklin (the "Wizard of Was"), who is now on WOR from 12AM to 5AM Sunday mornings on WOR was one of the first talk show hosts on WPAT. After being purchased by the North Jersey Broadcasting Company in 1949, WPAT was granted full-time status and moved to 66 Hamilton Street. At that time, 75% of the day was programmed with Country music and the evening was reserved for continuous "Easy Listening" music. Gaslight Review, the hallmark of WPAT began in 1951 and was one of the most-copied formats in radio ("Cocktails for Two" on WWJZ, "A Touch of Velvet" on WADB). 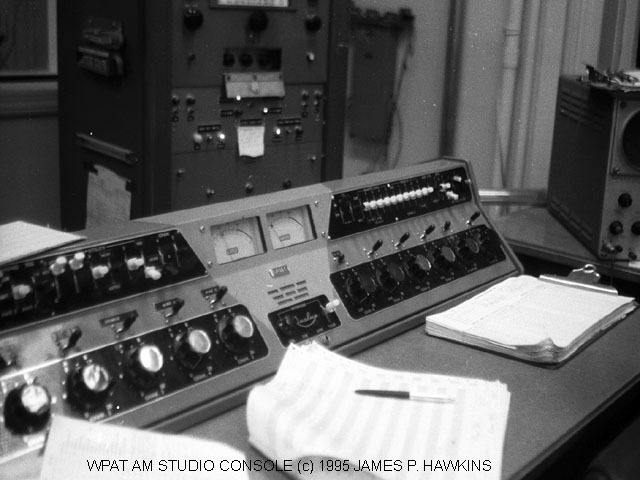 On February 1, 1948, WPAT was one of the first stations to broadcast on the FM band on 103.5 MHZ. It began with the call WNNJ before becoming WPAT-FM. A windstorm blew the antenna down, but at the time, there were so few listeners, that it wasn't until March 1957, when WPAT-FM returned to the air on 93.1. Notably, this was the frequency which was used by Major Edwin Armstrong's pioneering FM station KE2XCC. As an added bonus, WPAT could now identify itself as 93 on both AM and FM dials. The studio was combined with the transmitter site at Broad Street and Hepburn Road, Clifton in 1957. In 1959, the combined facilities moved to a new building at that location. In 1961 WPAT was sold to Capital Cities Broadcasting Corporation for $5 million. When FCC regulations required AM/FM pairs to operate separately, WPAT merely staggered the tapes that were used for each "Gaslight Revue." By 1969 WPAT's Arbitron rating was 16, which was half of the market-leading rocker WABC but double the numbers for classical WQXR. In 1984, WPAT became the first AM stereo station in New Jersey. Over the years between 1970 to 1996, WPAT gradually changed its formats through a number of transitions from Easy Listening or Beautiful Music to Soft Rock. In March 1996, the biggest change occurred when WPAT was sold to Heftel. The station was then converted to a Spanish-Speaking station. Accessed times since April 3, 2000.